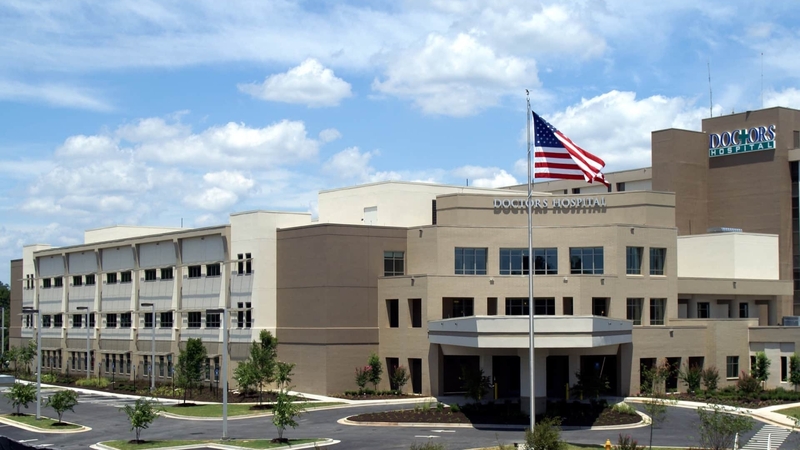 Phase One of this project includes a 140,000 square foot renovation and South Tower addition at Doctors Hospital in Augusta. The main goal of the new addition is two-fold: consolidate registration and waiting functions to the front of the hospital while adding patient room capacity. Registration, laboratory, and pre-admission functions are now located within easy walking distance of the new main lobby so that most pre-operative needs of patients are met on the same floor. The new South Tower also includes twenty-four private patient rooms (second floor) and twenty-four ICU patient rooms. A renovated and expanded main lobby space infused with an abundance of natural light including a second floor overlook with clerestory windows and enlarged waiting area. Each patient floor includes large family waiting areas and a private physician consultation room. New education and conference rooms are located on the first floor. New Remote Powerhouse was added relocating boiler and generator functions away from the hospital allowing for future expansion possibilities. Phase Two of the project includes a 22,000 square foot build-out of a new medical office building located directly adjacent to the hospital’s renowned Joseph M. Still Burn Center. The build-out includes relocated hydrotherapy and hyperbaric departments, a relocated and expanded wound care clinic, new burn center administrative offices, new classrooms, and new waiting areas for both inpatient and outpatient visitors and families. Phase Three of the project includes the renovation of the renowned Joseph M. Still Burn Center. The renovation area will include twenty completely renovated private ICU patient rooms, a new two-bay debridement trauma room, two new burn operating rooms and a new six-bed post-anesthesia care unit.